HA NOI (VNS)— A pile of vegetables is left on the ground in the garden of Nguyen Van Huan, a resident of Chua Village in Ha Noi's Me Linh District. Although fresh, they will not be sold at market. As Huan examines German turnips in the garden, he said he would lose even if he sold all his produce. "Vegetable prices have gone down dramatically since Tet holidays. They're so cheap that I don't even want to harvest them. I'll just dig them up and leave them, because I need the area for another crop that may do better," Huan said. He said the prices of vegetables in his garden were now half what they were at the same time last year. Nguyen Thi Chau, who has a garden nearby, said she experienced a huge loss this year. She invested about VND1.5 million (US$70) for 360 square metres of German turnips, but got back about only half that amount. 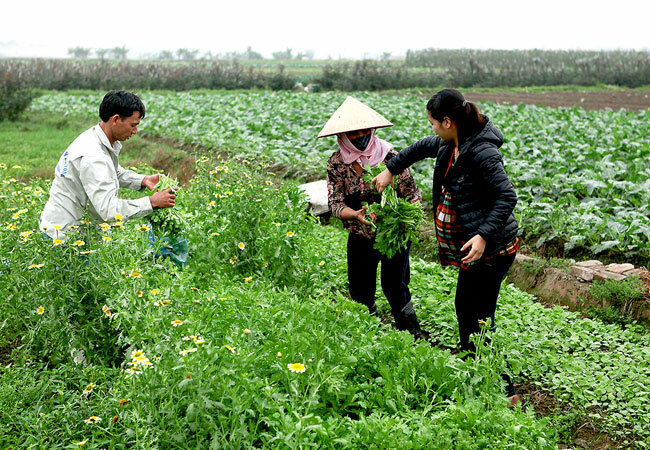 Tran Xuan Dinh, vice-head of the Cultivation Department, said that good harvests had led to a drastic dip in prices of vegetables throughout Viet Nam. "A good monsoon enabled farmers to have a good harvest," he said. "Everything grows well." While suffering losses, farmers have no choice but to continue their efforts in the hope that prices will get better. "What else can we do? When you are in the agriculture sector, you have to accept that you win this time and lose the next because of the weather," Nguyen Thi Chau said. Similar losses are being felt in the poultry industry due to outbreaks of avian flu. Nguyen Thi Binh, a resident of Soc Son District in Ha Noi, said poultry prices went down about 50 per cent after Tet holidays. However, she said input costs, such as foodstuffs and medicines were on the rise. Binh said she might have to stop raising poultry next year and find other ways to earn a living. The price of eggs has also dropped dramatically. Nguyen Van Long from Thach That District in Ha Noi, who harvests about 9,000 eggs a day, said he was losing about VND1 million (US$47) every day because supply was stronger than demand. Tong Xuan Chinh, deputy director of the Livestock Production Department, said in recent years, demand for meat products had decreased partly due to the economic downturn, while the livestock sector produced a similar amount of meat.